The team at Book Namibia offer an ultimate source of information regarding accommodation in Namibia on a website that is all-inclusive of the many faces of one of the most highly rated holiday destinations in Africa. 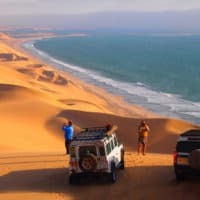 We know that there is just so much to do in Namibia that spending hours searching for the right accommodation can be a real challenge, especially with the many beautiful destinations in this vast land. When you stand at the edge of the Fish River Canyon you it won’t matter how far you have had to travel across an area that is reminiscent of Mars. Namibia is a country that is considered to be one of the largest countries in Africa, even by African standards, rich in diamonds, wildlife and a horizon that never ends offering contrasts in terrain that cannot be found anywhere else in Africa. If you really want to discover the heartbeat of the wildlife in Namibia up close, Etosha is a destination that offers you a rich experience in getting really close to a proliferate wildlife in this magnificent region. Namibia is a vast land of stunning contrasts and teeming wildlife wrapped in the warm embrace of the Namib Desert along its wild coastline, which is considered to be the only true desert in Southern Africa and is roughly between 55 – 80 million years old, and the Kalahari Desert on the north-east borders of this massive country. There are many countries in Africa that are well worth a visit, but for sheer splendor, diversity and a sense of seeing the ‘real’ Africa, we believe Namibia can’t be beaten.